We knew this next section wouldn’t be awesome but we were still looking forward to covering some ground. 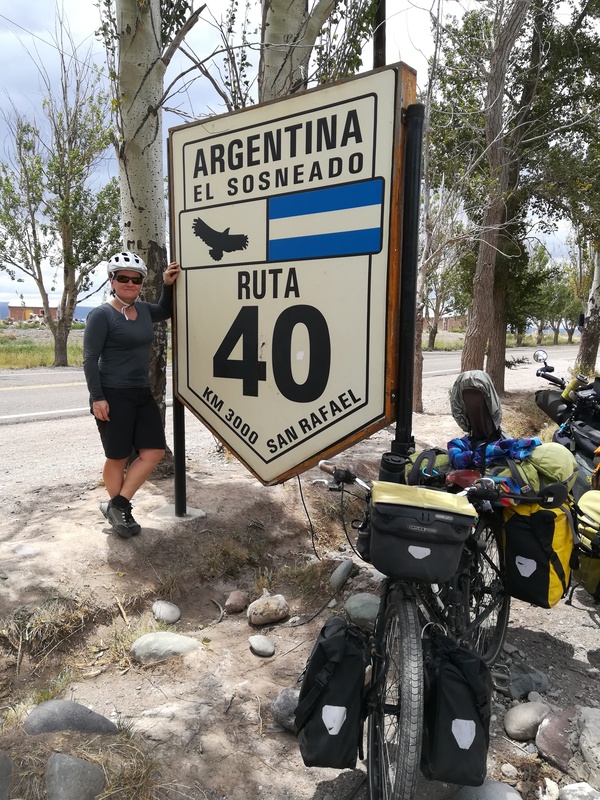 Amanda writes: On the 11th we left the hostel at a leisurely pace because we were tired and we knew the tail winds would pick up in the afternoon. With the sun only setting after 8:30 p.m. we have a bit more flexibility. We hit up the grocery store on our way out of town. We knew we had at least two days before seeing civilization again and wanted to prepare accordingly. By the time that was done it was after 12 and we saw a little restaurant on our way out of town and decided to stop for an early lunch. Neither of us had loads of energy so it seemed like a good idea. We each had the super hamburger with fries and it really was super. It was so big I couldn’t finish mine. All fueled up we finally started to cover some miles. Shade was hard to come by so we stopped riding when we saw some. It was mostly climbing but didn’t seem that hard work the tail winds and the gradual grade. We made it to a little store that we had read about and got some water. We chatted with the guy for a bit, had a drink and contemplated stopping here for the night. We were 55k in. I wanted to keep going to keep the following days more manageable. Andrew and his bum weren’t too keen but came along anyway. We traveled another 15k trying some gates to small roads that crossed the highway. All the gates were locked so we kept going. We went to the salt museum and asked the boss if we could camp and he said yes of course and even let us set up in the factory. We enjoyed a great sun set over the salt lake. 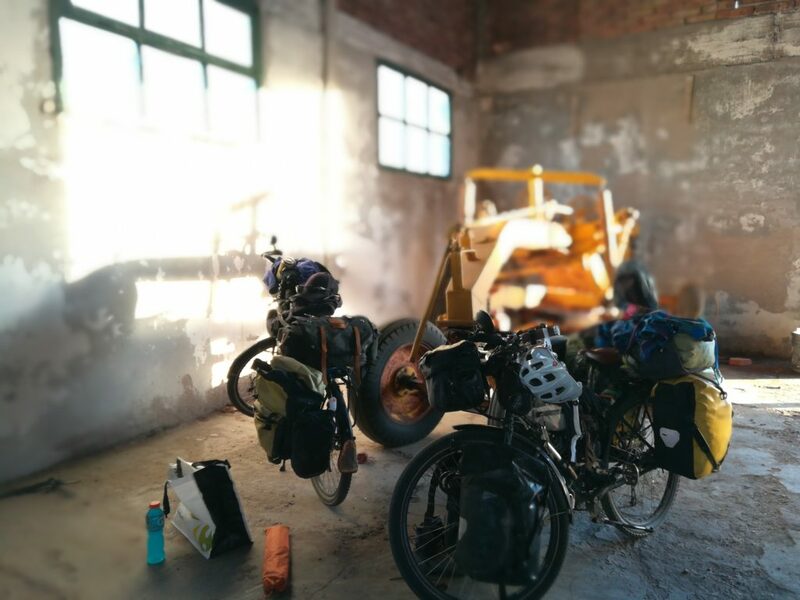 Our bikes inside the factory at the salt mine sheltered from the wind. Andrew settled inside the salt factory to make some dinner and relax protected from the wind. 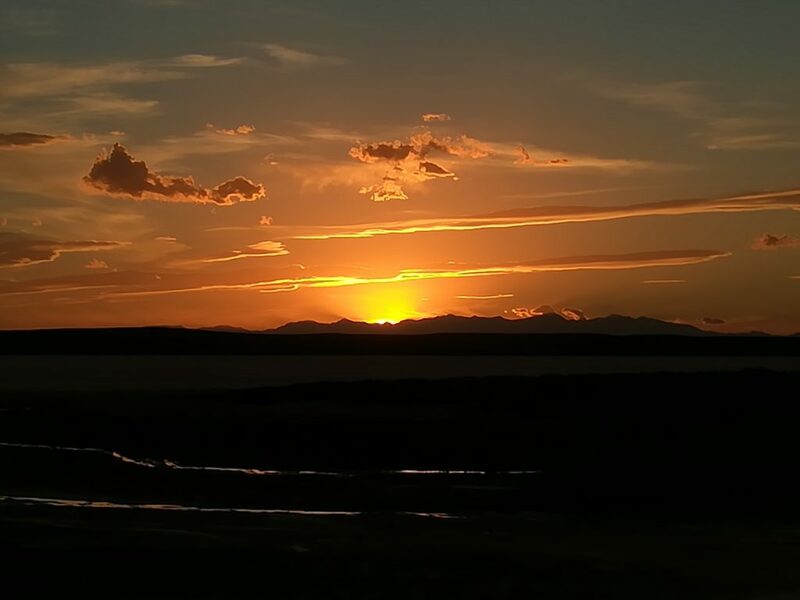 A nice sunset by the salt lake in Argentina. 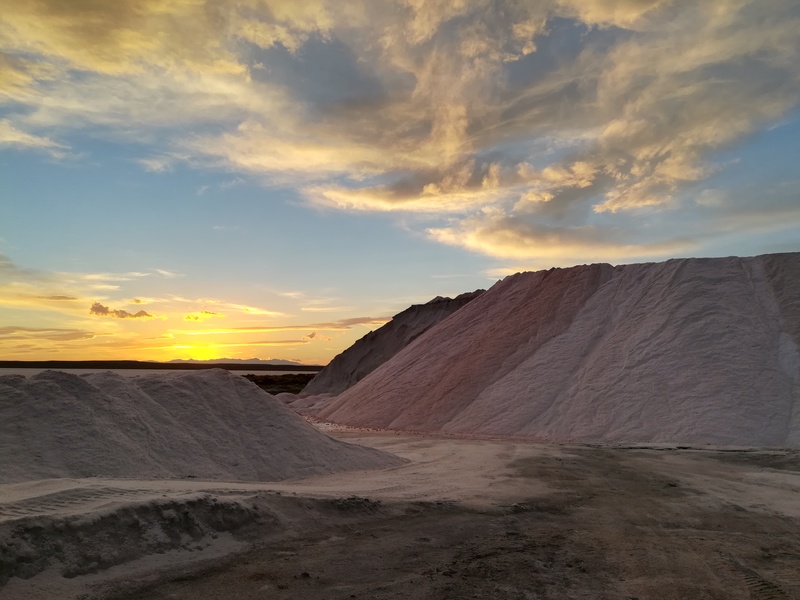 The piles of salt ready for production with the sun setting. On the 12th we hopped back on the relatively straight and boring road. We got to see some fun animals that I had never seen before. Something between a ostrich and a bird and man can they run! It was pretty cool. Again with the wind at our back we were able to cover over 120km. It’s always such a great feeling to go so far in one day. We arrived in town and tried to find a place to stay. Many places were closed and we felt like it was a ghost town. We found an open hostel but they only had shared rooms and this princess wanted her own space for a couple of days. As we were leaving the hostel with shared rooms the owners drove by us and tried to convince us to stay. Andrew told them I needed a private room and they said okay and drove off. We continued riding around town and were stopped at a store to buy a nice bottle of wine for our efforts today. The owners of the hostel showed up again to try and convince us. They told us they’d give us a private room for a little bit more money. Their efforts reminded me owners in Cuba who wanted your business. We signed up for two nights and settled in. Overall not a bad place and we basically had our own apartment. I think I’m getting soft. Andrew writes:I think the hostel in San Rafael is one of the first dormitory-style hotels in a long time that I can remember. I won’t soon forget that the BBQ started up at 10pm last night just as I was going to sleep, and live music followed shortly thereafter until well into the night. It was good music too. If anything, I just wish that we weren’t so tired from cycling so that I could have enjoyed the party with everyone else. It’s just a matter of adjusting to the Argentine time zone. Dinner around 9, staying up well past midnight every night. Ugh, I’m not sure that I can. Fast forward again to the next morning and our route was flat, with nary a turn, and we had the wind at our back. Malargue seemed a little run down, even though there were dozens of cabanas and hotels on the edge of town. Maybe it’s just busy in the winter because of a nearby ski resort? In any event, I was happy that we had a room to ourselves. No sooner had we drifted off to sleep than I was awakened by some guys outside of our window starting up the BBQ and playing music on the radio. It was dinner time! 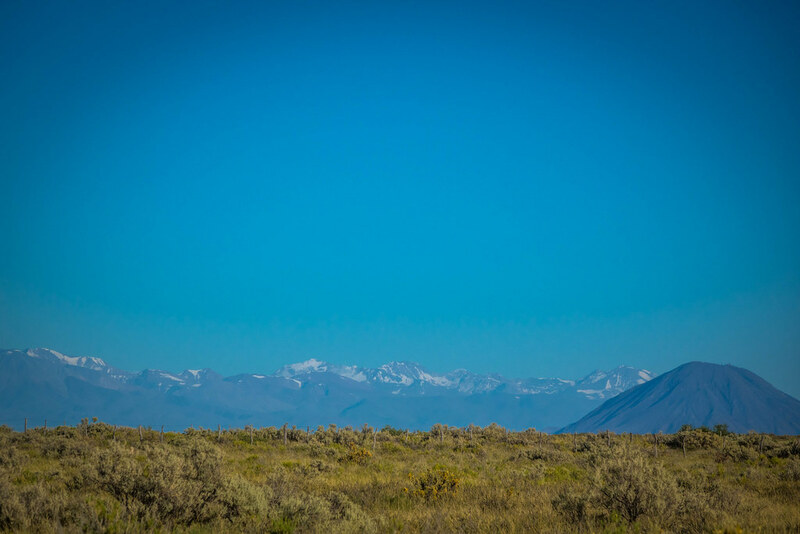 A look across the pampas at the snow capped Andes mountains with a volcano in the foreground. January 11, 2019 The entire route is on paved roads usually without a shoulder. It’s a pretty straight road. You climb out of the city and then it’s pretty flat the rest of the way. January 12, 2019 Again the route is paved and some undulating hills. January 11, 2019 There really is no place to stay between San Rafael and Malargue. It’s open desert with little wind shelter. 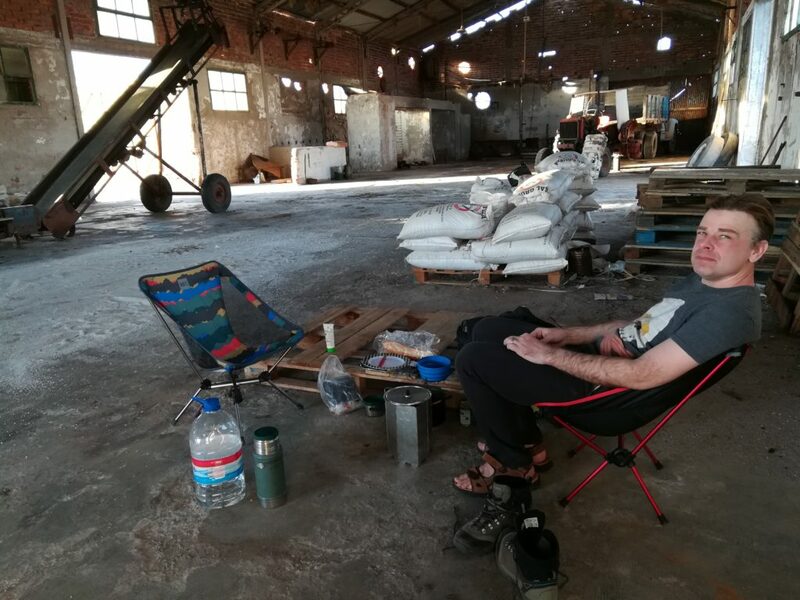 We asked at the salt museum if we could pitch our tent and they let us go right inside the factory building. January 12, 2019 In Malargue there are plenty of hotels and hostels to choose from. We stayed at La Caverna hostel. 450 pp in dorm room. We got a private room with bathroom and kitchen for 1300 per night. WiFi, laundry, kitchen, hot water. I very much enjoyed this read! You know there is kindness,goodness and some bad ones wherever you go…so nice the salt mine bosses let you stay safe inside! Mountain pictures are so pretty!